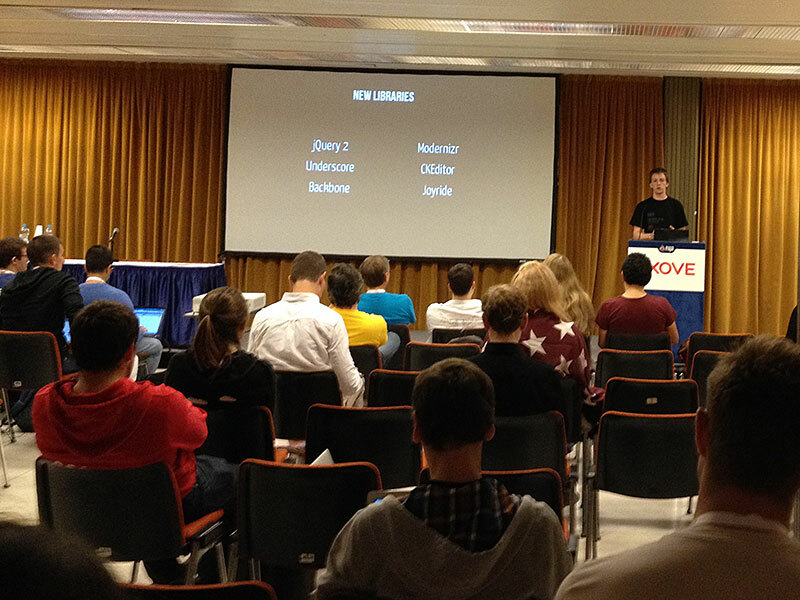 The team made a presentation at the closed Large Scale Drupal(LSD) event in Prague. The meeting, hosted by Drupal founder Dries Buytaert and Michael Meyers (VP of Large Scale Drupal), brought together some of the biggest companies currently using the popular CMS, like Pfizer, Disney, NBC, and of course Acquia. During his presentation, CKEditor Project Lead Frederico Knabben explained why Drupal chose CKEditor and demonstrated ACF in action, a key component added in version 4.1 that Drupal has been clamoring for. Tuesday was the official DrupalCon opening ceremony - a funny event (by programmer standards) that involved some awkward singing by Gábor Hojtsy. During his speech, Dries Buytaert thanked the unique Drupal community. 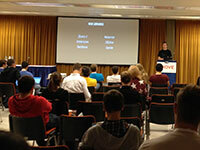 CKEditor’s Frederico Knabben and Wiktor Walc were in attendance. After the ceremony the team was off to the various sessions presented throughout the day. Fred and Wiktor attended the Automated Acceptance Tests with Behat session, hosted by Nathan Lisgo, then Building Really Fast Websites with Drupal 8, presented by none other than Wim Leers. The latter dealt with caching and performance, which are a big improvement in Drupal 8. Later in the day, the CKEditor team went for a productive dinner with Wim Leers and Nathan Haug (Quicksketch) where they discussed the Drupal community's structure and CKEditor's future. After Twig, a Templating System for Web Designers, the team had an interesting talk with designers from Acquia, Kevin O'Leary and Bojhan Somers, who revealed they were happy that CKEditor 4 matches Drupal 8’s design. Topics of discussion included converting icons to SVG format and the overall end-user experience on mobile devices. They were actually interested in helping us design the new CKEditor UI for mobiles! Next up was the Q&A (BoF) CKEditor for Site Builders, where the core CKEditor team (Frederico Knabben, Wiktor Walc, Piotrek Koszuliński and Aleksander Nowodzinski) presented CKEditor’s various features. The crowd was pleased to see how easy it is to configure CKEditor in Drupal 8. They also had nothing but positive impressions of ACF, the editor's pasting ability and image handling features. Numerous questions were answered on how the editor handles images and plugins. 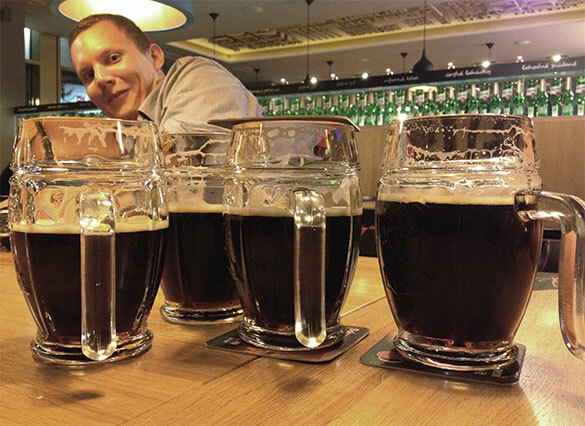 In the evening the team went to a local bar where they tanked 23 beers and brainstormed CKEditor's direction! The day started with another Q&A session conducted by the CKEditor team, this time entitled CKEditor for Developers. The presentation gave everyone in attendance a deeper understanding of how to integrate CKEditor on various platforms, and how to develop new plugins and Widgets - a cool new feature introduced in CKEditor 4.3 Beta. After the session, Jesse Beach showed off CKEditor's configuration internals in Drupal 8's. The editor can be easily customized by dragging and dropping icons to the toolbar through the admin section. The team took part in a coding Sprint coordinated by Gábor Hojtsy and other Drupal bigwigs that produced some interesting results. For starters, it's quite possible future versions might include an oEmbed plugin in CKEditor core, which would make embedding various forms of media a breeze! Snippet is another brainchild of the Sprint. It would let users easily add colorized code snippets to the WYSIWYG area. This would be a Widget, as opposed to the current Add Code plugin. If you ever had doubts about the security of CKEditor, later in the day Wiktor had a 7-hour-long discussion with Ivo Van Geertruyen​, member of the Drupal security team! 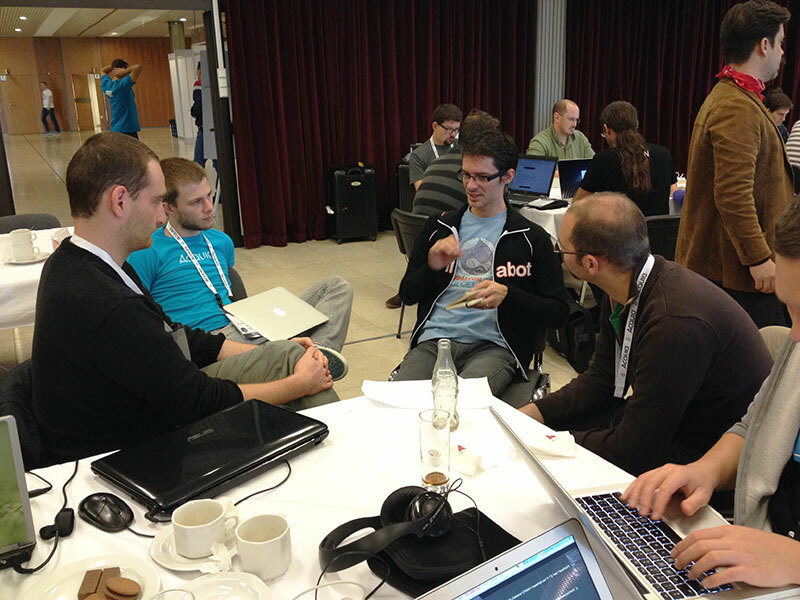 On Saturday Piotrek Koszuliński worked with Wim Leers on a prototype of the "Embed Drupal" Widget. It would allow embedding pieces of content (a node) into the content of another node. This required a Widget (implemented by Piotrek) and a Drupal integration like a dialog or service, which Wim worked on. This all started during the official Sprint venue but both programmers decided to move to the calmer surroundings of a local restaurant! It should be noted that Collaborative Editing got quite a bit of interest from various individuals throughout the week. As a result, the team is now considering adding it in future releases... maybe. 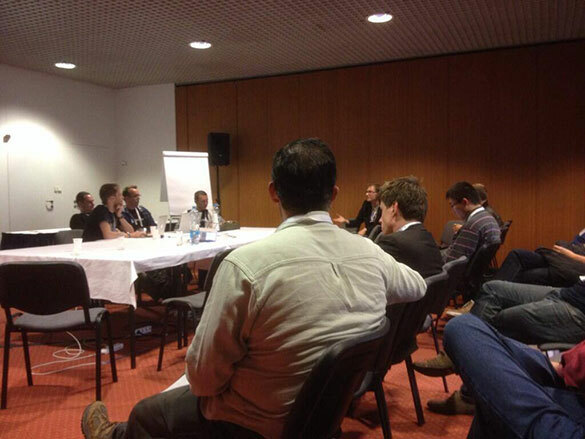 In all, DrupalCon Prague 2013 was a great experience! With so many talented individuals in attendance the team got their creative juices flowing and made considerable headway establishing CKEditor’s presence in Drupal 8. We learned a lot about Drupal's community, how it operates, its pros and cons. This will no doubt result in smoother cooperation in the future. Let us know what you think by leaving comments below. 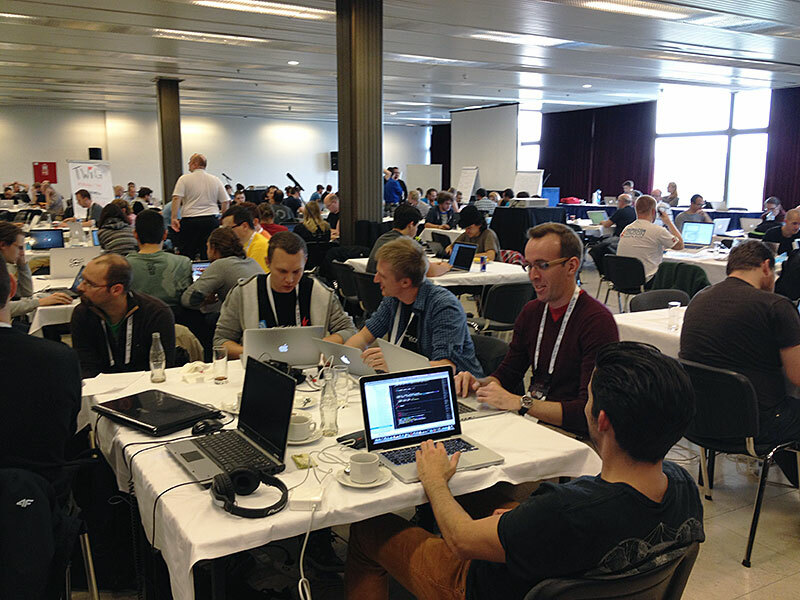 To see more DrupalCon pictures, visit our Facebook or Google+ pages!